hey! i want to know about the JBS placements and college life thier . can you please guide me through.i am planing to join the current batch. ur reply would be appreciated . Why Choose Jaypee Business School over other B-Schools? 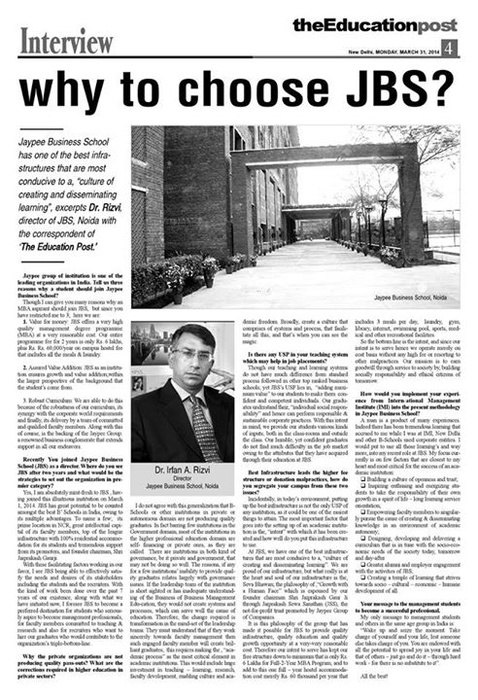 Our new esteemed Director, Dr. Irfan A. Rizvi has an answer for you in his interview with The Education Post. DATA ANALYTICS- Central for Business Reinvention. In line with the changing scenario in which the businesses are now operating and how they are operating, given the fact that we are now living in an era of information technology, companies are adopting new technologies to bolster their businesses. One of them is Big Data Analytics, Big data analytics is the process of examining big data to uncover hidden patterns, unknown correlations and other useful information that can be used to make better decisions. With big data analytics, data scientists and others can analyze huge volumes of data that conventional analytics and business intelligence solutions can't touch. Also the explosion of data production, storage capabilities, communications technologies, computational power, and supporting infrastructure, data science/analytics is now recognized as a highly-critical growth area with impact across many sectors including science, government, finance, health care, manufacturing, advertising, retail, and others. Thus, data science technologies are being leveraged to drive crucial decision making. Data science/analytics can be defined as a set of applications, practices, skills and technologies designed for investigating and analyzing business performance in order to achieve more strategic decision making and structuring in the future. With organizations acquiring vast amounts of data at an unprecedented pace, the demand for professionals with strong business analytics skills has never been greater. Today's leading companies recognize that employees with a good understanding of general business, coupled with strong exposure to analytics techniques and database management tools, are critical to the enterprise's long term success. Business analytics makes extensive use of data, statistical and quantitative analysis, explanatory and predictive modelling, and fact-based management to drive decision-making. Analytics may be used as input for human decisions or may drive fully automated decisions. Some application areas include market basket analysis, consumer behaviour, social network and sentiment analysis, recommendation systems, fraud and crime detection, healthcare delivery, healthcare fraud, health sciences (e.g. genomics), supply chain, finance, cyber security, libraries and network security. Companies like Wal-Mart, HP, Deloitte Consulting, and Chevron, all of whom are heavy users of data analytics, have expressed an interest in hiring to meet this need. Digital Marketing Has Changed The Way Companies Market their products. Companies are leveraging the benefits of Digital Marketing to increase their market share. But digital marketing is accompanied by various challenges as well. The following article by our esteemed faculty will discuss more about the challenges faced in digital marketing. The proliferation of the internet into every home and it's humongous presence in the lives of the youngsters today, has opened up myriad opportunities for Digital Marketing. The cost effectiveness of this form of Marketing, coupled with it's widespread reach, with a significant consumer population spending a sizeable amount of time online, is making it a popular choice for organisations. However, Digital Marketing is facing several challenges. Companies are experimenting with the virtual world and do not have a clear understanding of how the power of the online medium can be harnessed to derive maximum benefit. Companies and marketing professionals do not know how Social Media and E-Marketing can favour their brands and make consumers buy them. Without knowing how Online Marketing affects the various dimensions of the consumer decision making process, organisations and individuals run the risk of aiming their directed efforts at the wrong targets, wasting time and money on ineffective activities, and generally failing to harness the potential of the online world. -Need to coordinate data, tools, technology and talent across multiple functions. A fast emerging field, Digital Marketing requires well directed training to make an individual or organisation unleash it's complete potential. The knowledge of Marketing in today's era is clearly incomplete without an understanding of the digital world. So, You Think You Want a Career In Human Resources? Here's a piece of advice by our esteemed faculty at Jaypee Business School. In an era of attracting and retaining Talent, people management or Human capital management is important for business organization in gaining competitive advantage. It is done in various ways from hiring people, motivating, developing and facilitating them in performing their duties and responsibilities with help of supervisors, mentors and guides whom people across various departments and divisions report regularly. Thus, the role of HRM gets focused more on HR policy making as well as implementing it in hiring, developing competencies of people and monitoring HR activities in various departments and locations. Emergence of new technology has strengthened the implementation and monitoring of HR activities guided through various software applications, giving HR professionals more space for personal touch. Today, employees expect more from HRM in creating a better workplace, facilities to learn, and help them pursue their passion. Likewise, top management of the organization expects more accountability from HR professionals making them search for deliverables that can be measured with a focus on human capital and ROI. The other emerging trend is on cost reduction where HR processes are outsourced to third party with just 2-3 people in HR department for aligning the organizational requirement. The brightest side of careers in HR is that it's being rechristened as Business partners that will make it a core business activity. Core HR is therefore focused towards investment in people and making the organization as the “Best place to work, best place to pursue passion, best pay master, and best place to grow and perform”. Further, this aspiration has led to evolution of new perspectives in managing people namely – Employer Branding, Employer of Choice, Employee engagement and Employ-ability with competency of learn-ability, Employee readiness, and Employee Branding. Career profiles available to any job seeker in HRM are in the various roles like HR Generalists, HR Specialist, IR Specialists, Recruitment Specialists, HR Consultant, OD specialists, and or HR Analytics. In core sector, the opportunities available are HR generalist where they have to monitor HR initiatives and have knowledge of all activities. In service sector, focus is majorly towards recruitment, learning and development, pay and benefits requiring Specialists role. In HR Consulting organization roles offered are of HR Consultant with specialists like Change and OD specialists, Compensation and Benefits Specialist or customized roles required by the organizations. The new profile that is now evolving is HR Analytics that may include on collecting and interpreting volumes of data on hiring, training, compensation and attrition to make HR professionals quicker and effective people management decisions. JAYPEE IS AICTE APPROVED OR NOT?PLZ DO REPLY GUYS..
can the last date of giving the fees be extented?? can we do something and try to give 50000rs instead of 1,50,000 before 22nd feb?? ?